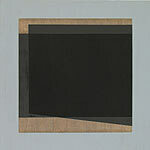 Both Mark Dagley and Don Voisine are mid-career abstract painters working with a geometric vocabulary. 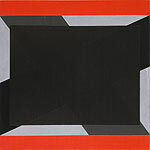 Voisine's paintings are the more reductive, and his work has a distinctively architectural structure in its use of central rectangular or square expanses of black bordered by narrower bands of bright colors or white. Voisine's paint surfaces are smooth but not entirely uniform, since the artist plays with transparency and opacity by varying the densities of paint within the geometries of his picture plane. While there is a sense of subtle movement and passage within his work, overall the artist creates a contained pictorial field and the paintings have an almost object-like quality. 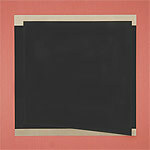 Voisine's paintings are notable for their formal clarity and rigor but also their nuance and refinement. In contrast to the meditative quality of Voisine's work, Mark Dagley's paintings are characterized by their exuberant expressiveness. 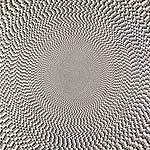 Dagley's paintings play with familiar tropes of geometric painting and supergraphics - dots, stripes, sine curves, and systematic progressions of forms -- often taking them to extremes. 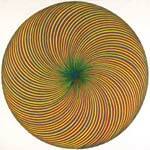 His most recent work continues to reference the techniques of logocentric design as well as spherical transcendental configurations, taking pure opticality, linear minimalism and geometric sequencing to radical visual conclusions. 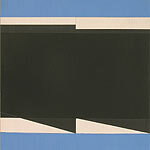 Yet, like Voisine, Dagley maintains a controlled pictorial environment of carefully selected color and geometric form.